I have a thing for signs. Not signs as in harbingers or black cat omens, but more like, well . . . signs. 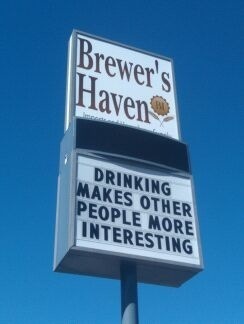 Weird that I am, I take pictures of signs that amuse me. I also snap shots of signs I want to edit. A writer’s work is never done. Here is a sign I want to edit. 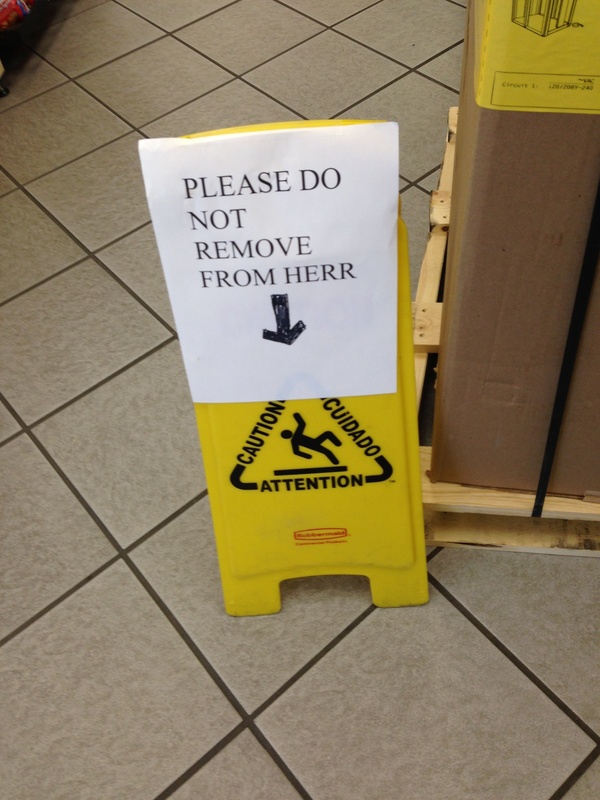 This store is not familiar with a commonplace punctuation mark. 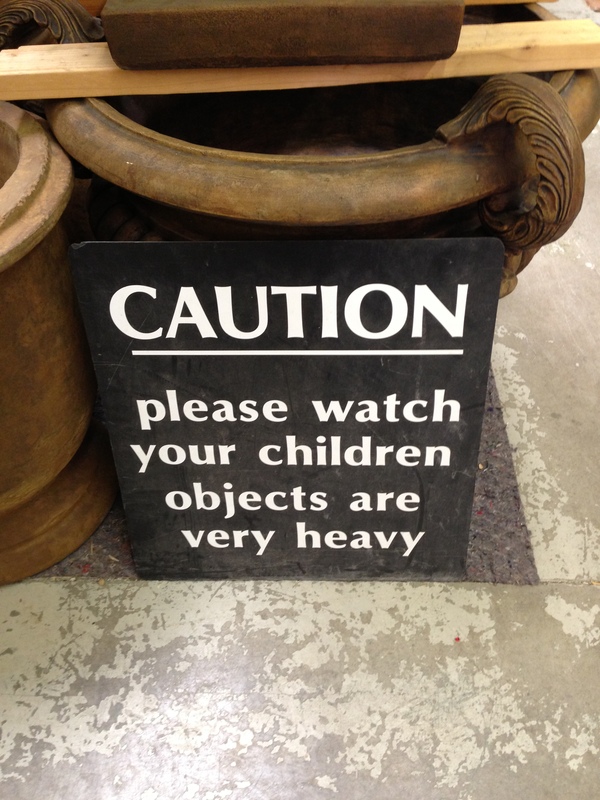 My children objects are very heavy too. Don’t tell my girls I said so. 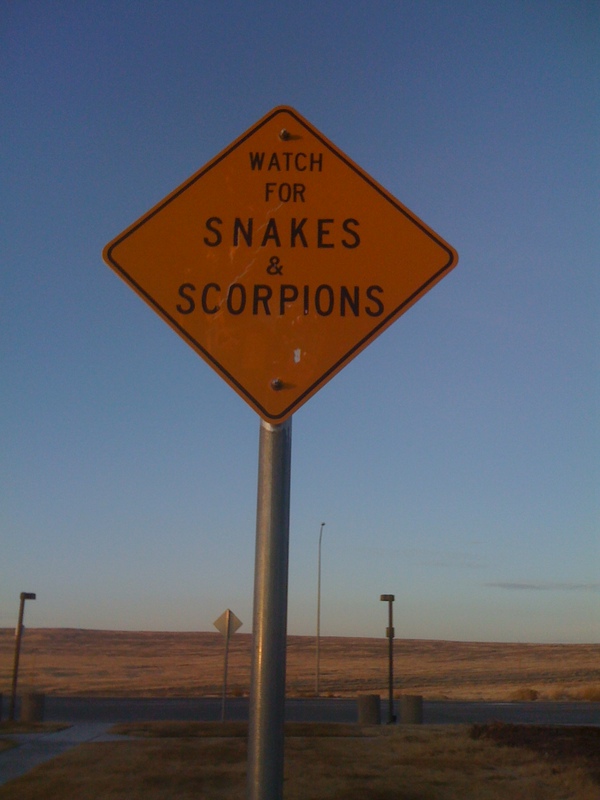 I saw this sign at a rest stop along the verdant Bonnyville Salt Flats in Utah. It was disconcerting, to say the least. Some signs make me chuckle. 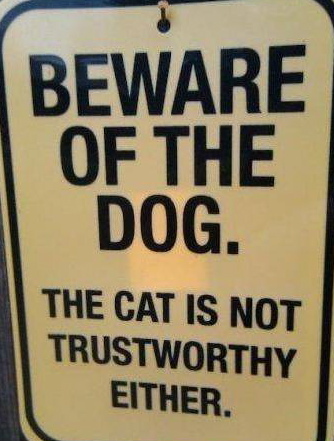 I love dog humor. 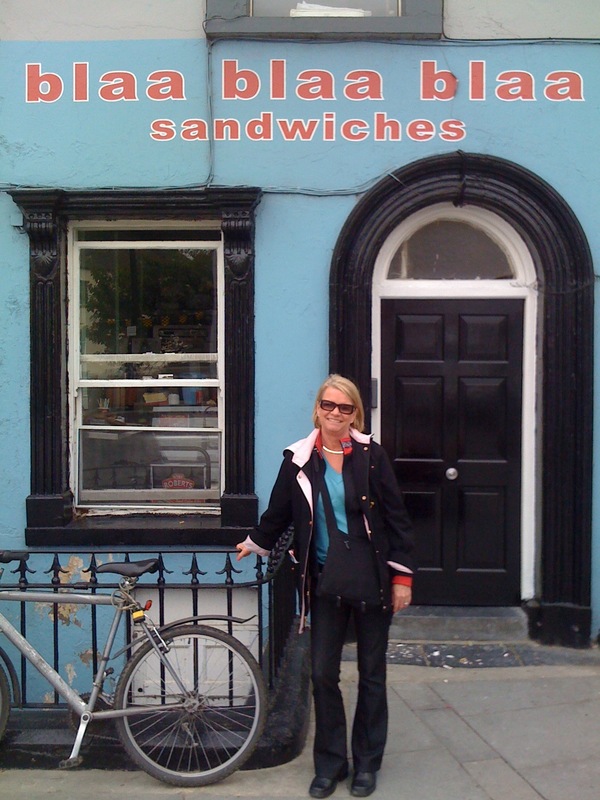 This sandwich shop was in Kilkenny, Ireland. I told you Irishmen have a grand sense of humor. 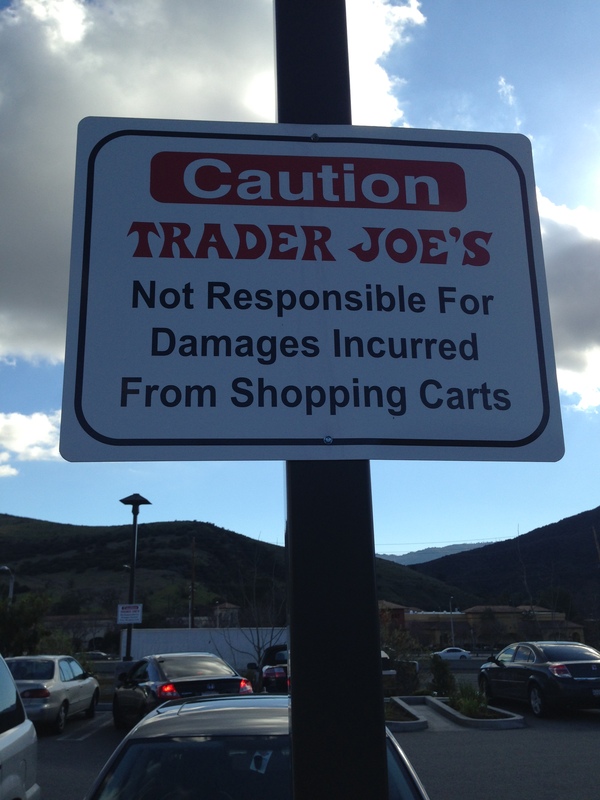 I used this sign in a recent post about typos. 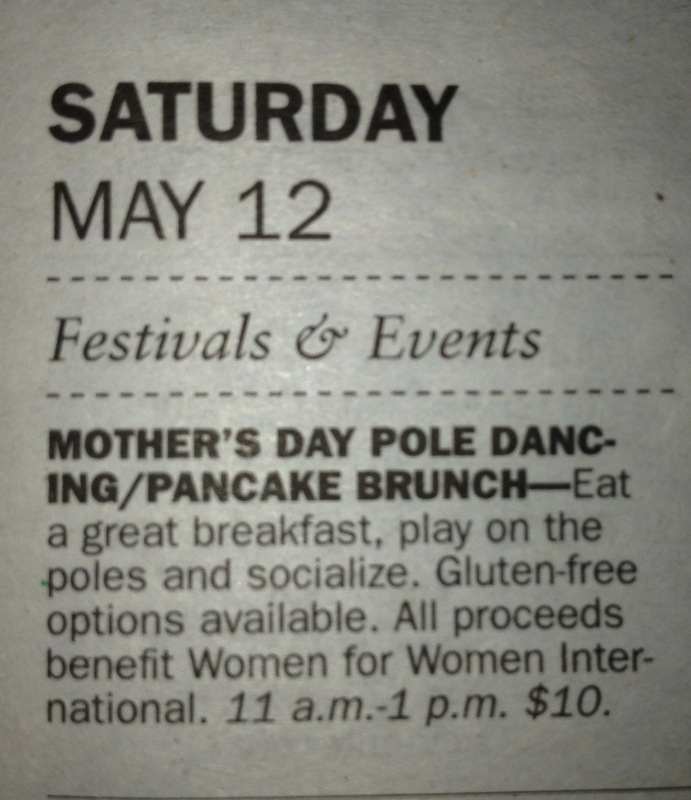 Nothing says, “I love you, Mom” better than taking her pole dancing. 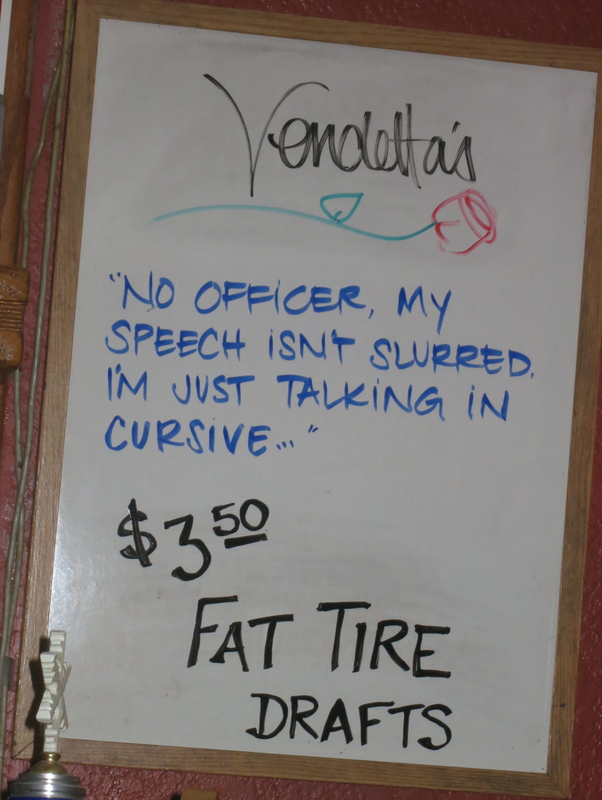 I should have used this sign in my now famous (or should I say infamous) Freshly Pressed post about cursive writing. And finally, no post is complete without a second mention of beer. My husband and I are in Los Angeles right now. To be precise, we are in Westlake Village, which is 30 miles west of Hollywood. My husband is here for a conference and I am here to be his arm-candy. Westlake is the only village I know of that has 8,000-square-foot cottages with 8-figure price tags, and come with pools, armed guards, and indoor tennis courts. The downtrodden masses here endure glorious sunshine most days, and are forced to bundle up when the temperature drops below 75 degrees. A common side effect of being rich is thin blood. That is why Charlie Sheen loads sweet young things into his mansion, er, cottage, right up the street from our hotel. I’m a born and raised Californian, but Los Angeles is a foreign country to me. They do things differently here. Let me give you a few examples. We are staying at the ever-so-swanky Four Seasons hotel. I highly recommend this place o’pampering and celebrity treatment. They treat you like a movie star here because for all they know, you are one. Heck, Britney Spears (not a movie star unless you call the Mickey Mouse Club excellence in cinema) got on the elevator with me when I was on the way to the gym to work out. She was on her way to the bar. Or maybe it was the other way around. Next to the hotel’s fancy-dancy spa is the California Health and Longevity Institute. The beautiful people of Westwood Village, meaning everyone who lives here, goes to the Institute for personal training, cosmetic and restorative dentistry (read veneers), acupuncture, acupressure, and energy healing, and dermatology and cosmetic treatments (read plastic surgery), etc. My husband and I took a cooking class in the Institute’s wellness kitchen today. 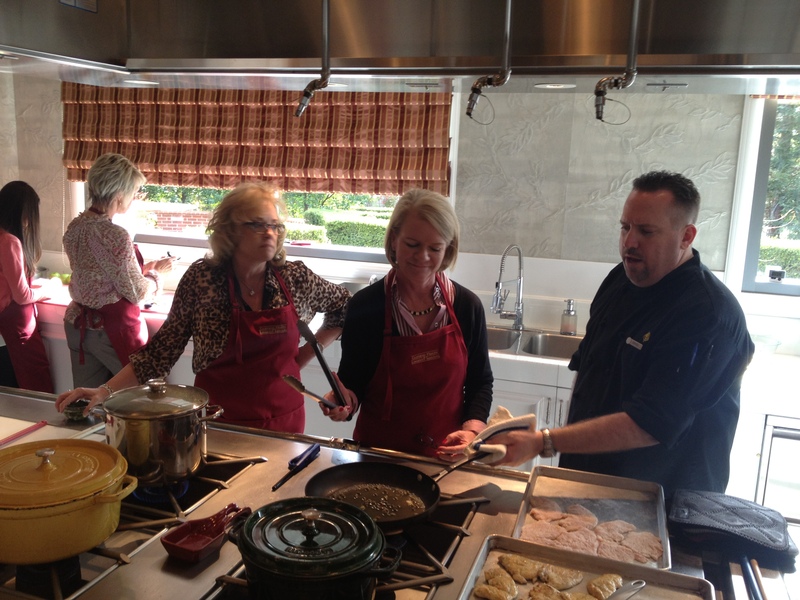 Chef in residence, Paulette Lambert, taught the interactive class. She is a registered dietitian and certified diabetic educator. Paulette was personable, cute-as-a-button, and a wealth of information. She also is a TV star as the dietician for Extreme Makeover: Weight Loss Edition. Note to self: Robin, you do not need to sauté everything in four tablespoons of butter. Otherwise, you might be the star on the next season of Extreme Makeover. Los Angeles does cars like Debbie does Dallas. Not exactly, but Los Angelinos have a love affair with their cars. Good thing, because they spend half of their life sitting in their cars while stuck in artery-clogged traffic jams. The freeways here look like used luxury car sales lots. The cars here don’t come with mundane names like Ford or Toyota. If you don’t know how to spell Lamborghini, you can’t afford one. I ran to the grocery store to buy a bottle of wine. Why? I paid $14 for a single glass of wine at the hotel bar. A bottle of El Cheapo at the grocery store was $9. While loading my jug of hooch into the car, one of the checkout ladies got into her car, which was parked next to mine. Apparently, her workday was at an end. Nothing against Los Angeles grocery clerks, but they can afford to drive Jaguars? I guess I shouldn’t have worn my tiara and ermine stole while shopping. It was a dead giveaway that I was a foreigner. Whaaaaaat? I shouldn’t fry chicken in lard? You gotta love the Irish. My husband and I went to Ireland several years ago for a milestone birthday. We fell in love with the place and the people. Gorgeous emerald expanses, breathtaking views, and a pub on every corner. Our kind of place. Irish villages, no larger than a wide spot in the road, have more pubs than the town’s population. At any time of day, the pubs are filled with locals enjoying a pint. How did we know this? We were enjoying a pint alongside them. One thing about Ireland we didn’t’ enjoy was the roads. Sure, they took us to magically delicious places, but most of the roads outside of Dublin are rutted and narrow and those wacky Irishmen decided it would be fun to stump American tourists by driving on the wrong side of the road. Irishmen are known for their sense of humor. Hundreds of years ago, out in the Irish countryside, farmers took on the backbreaking task of clearing boulders for their horse carts. Since the damn boulders were so heavy, they simply stacked them into walls lining the paths. A nice benefit of the road clearing was, voila . . . walls. Ergo, the two-lane country roads are the same width as a horse cart with little or no shoulder. Heaven forbid you get stuck behind a tractor or Irishman herding sheep up the road. You might as well sit back, open a beer, and sing Irish chanties because no way, no how, are you going to pass them. An article in the paper today about my beloved Ireland and her beer-swilling citizens made me laugh. It isn’t a surprise that the motion was shot down in the Parliament as being “grossly irresponsible.” The Justice Minister is a real buzz kill. To put things in perspective, three British pints is roughly one beer shy of a six-pack. I wish I could type with an Irish accent in sharing this line from the article with you. As if Irish roads aren’t challenging enough, let’s fill them with imbibed farmers on tractors. An Irishman tells me how he would solve the world’s problems. Then he tackles this road! I’ll hazard a guess that you are like me. Stop cringing. What I mean is you love nearly every word in your manuscript. You infuse your sentences with wisdom, jocularity, or sorrow. Or at least you try to do that. Some sentences and paragraphs sing to you. Others mutter into their oatmeal. I’ve spent time wondering why some sentences warble like Beverly Sills or Lady Gaga (note my clever multigenerational reference), and others have speech impediments and lie flat on the page. Sure, sure, sure, some sentences play an important utilitarian role to set the scene, give the reader a chance to regroup, or help with pacing. Not every sentence can, or should, rock the world off its axis and cause the Pulitzer Prize Nominating Committee to wake up and smell the printer ink. Do you have sentences or sections in your novel, poem, or letter to your illicit lover that sing to you? The ones that never fail to please? Or drive you crazy because you hear it in your head? Will you share it with us? Here is mine. As a bit of an intro, my main character was selfish, brash, and overly confident . . . as in . . . downright unpleasant to be around. When her mom dies, she has a talk with herself. Someone call Mr. Pulitzer. We have a winner. Now here is a sentence that sings. Grocery Shopping Extravaganza, Tattoos and All! Here in the western states we have a non-union, employee-owned grocery store chain called WinCo. It is like a Sam’s Club or Costco without the need to buy food in a convenient pallet-size handy-pack. You can buy one box of macaroni and cheese and not commit yourself to a life-time supply. 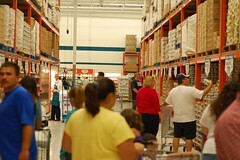 The prices at WinCo are a fraction of the big-boy stores like Safeway and Lucky’s. It is a no-frills-bag-your-own-groceries-and-don’t-even-think-about-asking-for-help-to-your-car kind of place. I’m okay with that. Why pay $5.46 for a box of Cheerios at a grocery store with mood lighting and Fabio as the head bagboy when you can pay $2.62 at WinCo under the glare of fluorescent lighting, right? Cheerios are Cheerios. Another good reason to shop at WinCo is the experience boosts your ego a notch or two. 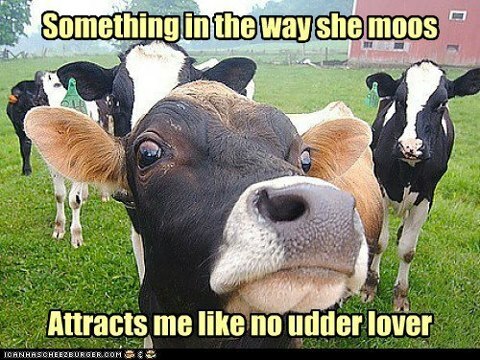 The clientele is . . . well . . . how can I put this delicately . . . a bit rough around the edges. The beautiful people shop elsewhere. Feeling a little down about the three pounds you put on over the holidays? Head to WinCo! You walk through the doors and feel as svelte as a runway model, or maybe a gazelle on a starvation diet. The shopping carts have signs on them that say, “Wide Load” and they are not referring to the cart, but the cart pushee. If the Centers for Disease Control commissions a study on the nation’s obesity problem, they can just set up shop in WinCo and watch the world go by with Oreo and Ding Dong-filled carts. Before you get your dander up over my observation about the customers-at-large at WinCo, I have nothing against these Jenny Craig eschewers. I simply made an observation from behind my tofu and bean sprout-filled cart. My Oreos were hidden under the tofu. Aside from tasty treats in foil packets, my fellow WinCo female shoppers love their manicures. The woman in front of me had nine-inch nails. No, she wasn’t from the band of same name. She had the longest nails I’ve ever seen and they were painted Pepto Bismol pink. I’m sure the nail polish bottle had a catchy name like “Barbie Claws Ken” and she couldn’t resist the celebration of neon pink. I had to stare. At the base of each nail was a filigree tattoo and all I could think was, “That had to hurt.” I get a hangnail and I’m off to the emergency room. Speaking of tattoos, some of the good folks at WinCo have more tattoos than teeth. There was a mother-daughter pair who looked quite fetching in their matching tube tops (san’s undergarments) and florid dragons sprawled across acne-pocked creamy-white backs. Ew. Don’t get your dragon tattoo in a kerfuffle. I have nothing against tattoos except when they are on a body, say mine. The women are equally fond of their body-hugging clothing. Bare midriffs and cleavage abounds. But enough about me. Shopping at WinCo is a shopping extravaganza. All the groceries you need at low, low prices and fodder for sparkling dinnertime conversations that start with, “You won’t believe what I saw at WinCo today.” Also, much can be gleaned from the adventure and put smack dab in the middle of your novel. You can’t make this stuff up. So, What’s It Like Being Freshly Pressed, Robin? Dozens of you asked what happened to my stats when I was Freshly Pressed. Well, maybe a handful of readers asked. Er, make that a few people. I feel rather uncomfortable bragging talking about my stats. I wouldn’t want you to think I am the bragadocious sort. So, what I will talk about is the overall experience. On Monday, November 26th, I did a post titled, “Is Cursive Handwriting Dead?” A newspaper article about the elimination of cursive handwriting from many school’s curriculum inspired me to write the post. The issue struck a nerve with my regular buddies and we had a lively conversation. On Thursday of the same week, I received an email from WordPress saying I was to be “Pressed” in a day or two. Whaaaaaaaaaa? Me? No way, Jose. We made a terrible mistake. We meant to send that email to Ms. Doyle. There will be no Freshly Pressed for you! On Friday of that week, my husband and I went to San Francisco for the weekend. Nothing out of the ordinary happened. Until . . . 1:00 pm when blog comments started flooding in. I though, “Oh look! Everyone is so engaged in blogging today.” Then I looked at my stats. Yowza. My phone vibrated so often with comment alerts that I suspect our hotel-room-neighbors suspected we were up to something else. We were in San Francisco for fun, and my husband’s idea of a good time isn’t watching me answer comments. He is funny that way. So, I figured I would attend to the comments after our weekend get-away. At the end of Day One of being Freshly Pressed I had 1,204 views. From then on, it has been a slow decline in viewership, but it is still a far cry from what it was pre-Freshly-Pressed-ness. I gained 192 new followers thanks to being Freshly Pressed. A handful of those folks continue to come around for a cup of coffee and comment. I guess I bored the rest of them. My post had 464 people “like” it but there are only 100 or so of those Gravatar-thingys. Anyone know why? I lost track of how many times the post was re-blogged and pingbacked. Let’s just say dozens. My evenings were spent swilling valium-laced cocktails. Moving Mom was harder than I thought it would be. I answered many comments, but many more were left hanging in the lurch. What is a lurch, anyway? So, the post received 490 comments (some of them mine). If I had time to answer all the comments and engage more with the folks who stopped by, I wonder if more of the new followers would have stuck around for more than a quickie. Maybe in the Freshly Pressed Hall of Fame my stats are pathetic and WordPress is thinking about revoking my status. Maybe these numbers don’t impress the likes of you who get 1,500+ views on a slow day, but I have to say, it was a big dealio for me. The Freshly Pressed experience was humbling, exhilarating, and overwhelming. It was like competing in a lumberjack logrolling contest wearing flip-flops . . . hard to keep up. Would I like to have the experience again? You betcha! Posting this photo because it will have a life-changing impact on your writing. The photo will move mountains, part seas, and publishing deals will flood my in-box because of the powerful (read strong) words the photo conveys. Truer words were never spoken and Hemingway will back me up on that. Damn. Strike three. I’m out. 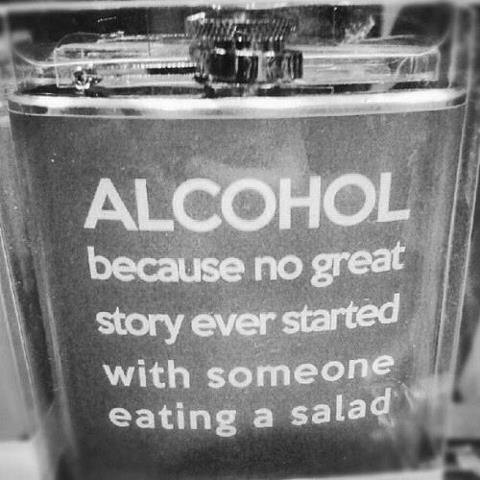 The gosh-darn-honest-truth (ever heard of a dishonest truth?) why I’m posting the photo is because it made me laugh and snort coffee out my nose. Ew. I hope it makes you laugh too and even though I am flippant today, I believe publishing deals will come my way because of this thought-provoking post, er, flask. If you put words to the photo, what would you say? Moi? The Next Big Thing? Try to stay awake folks. The idea for my novel sat untouched in a dusty corner of my brain until one day when I thought, “I wonder what would happened if I started writing?” Voila! A novel is born. Quit laughing. I didn’t put it in that genre. A literary scout in England read In Search of Beef Stroganoff and said it falls in the category of Quality Women’s Fiction. Hey, who am I to argue with a professional in the literary business? Easy. She is a friend of a friend. He pitched my novel to her and she agreed to read it. It’s not what you know, but who you know, right? I hadn’t heard the term literary scout before. 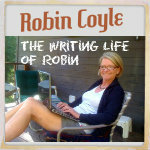 Lucky for me, in her long email after she read my novel, the scout explained her role in the book world. She ended her email with excellent feedback on where and how I can strengthen In Search of Beef Stroganoff, and some insight into the nuts and bolts of the publishing world. Oh gosh darn it. Let’s get the damn thing published first. A young woman searches the world for her mom’s beef stroganoff recipe and in the process finds a love of cooking, happiness, and an 88-year-old best friend. Like many of you, I’d love to be picked up by an agent and traditionally published. Since that is a tough row to hoe right now, I most likely will self-publish. I wish I kept track of that. I dabbled for a year or so, off and on. Mostly off. Then, when the story started taking shape, I worked on it for a couple of years. I’m still working on it. The School of Essential Ingredients by Erica Bauermeister and Tender at the Bone by Ruth Reichl. My love of reading, writing, and food inspired this story, as well as my husband’s blind faith and encouragement to do so. It is damn good! Wink. Wink. OK, to be honest, I’d say the novel blends humor and human frailty with the magical power food has in giving comfort and bringing people together. Thank you Pete, Lori, and JM. You guys rock!